Pretotyping. Build the Right it. Pretotyping: Know What To Build Before You Build It. Developed at Google. Perfected at Stanford. Developed at Google by Alberto Savoia (now a Stanford educator), Pretotyping is a way to test an idea quickly and inexpensively by creating simple, working experiments to get customer data, not their opinions or assumptions. 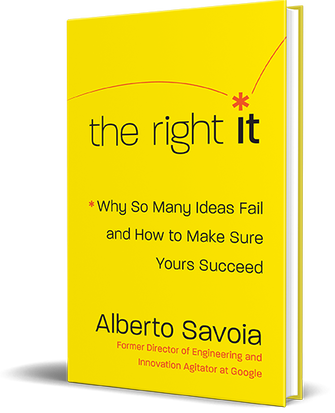 As Google’s Innovation Agitator, Alberto forged, tested and perfected Pretotyping, a powerful set of tools and techniques to help innovators, product managers, and entrepreneurs make sure that they are building The Right It before they build It right. Pretotyping combines the smallest possible investment of time, money and resources with the strongest possible learnings. Most people believe that their venture will be successful, but the Law of Market Failure tells us that up to 90 percent of most new products, services, businesses, and initiatives will fail soon after launch—regardless of how promising they sound, how much we commit to them, or how well we execute them. This is a hard fact to accept. Before you invest time, energy, and money into your next project, make sure you are building The Right It. In my new book, I offer a strategic approach to help you beat market failure. This approach is based on case studies, insights from my time at Google, as well as my experience as an entrepreneur and consultant. Some of the valuable lessons in my book include strategies for collecting your own market research, how to formulate a market engagement hypothesis, and why “pretotyping” tools are key to gauging if there is a viable market for your product or idea. Pretotyping Roots Are In Google & Stanford. The concept of Pretotyping was originally developed by Alberto Savoia, Google’s Engineering Director and Innovation Agitator. Since then, Pretotyping has spread quickly and globally. Alberto’s book ‘Pretotype It’ has already been translated into several languages, and classes on Pretotyping are taught at Stanford and other universities globally. We were trained in Pretotyping by Alberto Savoia using his proprietary techniques and concepts. We have implemented Pretotyping in corporates, startups and scaling businesses throughout Australia. We believe Pretotyping is the most effective way to find, validate and prove the right idea, faster than ever before. Ready to get started with Pretotyping? Speak to Australia’s Leading Pretotyping Experts, Exponentially. We've helped businesses save millions of dollars by not building the wrong ideas. To start Pretotyping, talk to Leslie Barry from Australia’s Leading Pretotyping Experts, Exponentially. Rich founded People Rocket, A Management Design Firm, combining Business, Academics, Arts, and Design to bring a fresh, innovative, design-fueled approach to sustainably increase the performance of people, teams and cultures. Rich coaches executives, leaders and teams at organizations such as the Clinton Global Initiative, Mozilla, Singularity University, Informatica, Genentech, Airbnb, Deloitte, Federal Reserve Bank of San Francisco and SAP, Istanbul 2020 Olympic Bid Committee, TEDx, Google, and JP Morgan Chase. Rich is a Lecturer at Stanford University's Graduate School of Business and teaches at the Stanford Hasso Plattner Institute of Design (d.school). He has guest lectured at London Business School, Aalto University in Helsinki and Singapore, Pontifical Catholic University of Rio Grande do Sul in Brazil and Hong Kong University of Science & Technology (HKUST). Rich challenges leaders, groups and companies to stretch farther and achieve more. He helps world leaders and change-makers inspire others to action. Today, innovation is more critical than ever for a company's success and survival. In fact, being innovative is no longer enough. To stay on top, companies must become Apex Innovators. And to do that they need to experiment with and test a lot of innovative ideas in order to find The Right It—innovative ideas which, if competently executed, will succeed in the market. I am currently focused on helping already successful companies and entrepreneurs become even more successful by teaching them the tools, techniques, and tactics they need to become Apex Innovators. Once a Googler, always a Googler, so I continue to collaborate with Google as Innovation Agitator Emeritus. Leslie Barry has lead innovation teams at major Australian companies and has co-founded numerous start-ups, selling two. Like his clients, Leslie is an ideas person – and is passionate about creating platforms for better idea creation and testing. This passion led Leslie to the world of Pretotyping – and he now works with leading Australian and international companies, start-ups and innovation investors, sharing his extensive knowledge and experience and helping build a growing community of Pretotyping experts. At Exponentially, Leslie partners with experienced and enthusiastic innovators and trainers in sharing his extensive Pretotyping knowledge. He also consults with corporate innovators, accelerator programs, start-up incubators and innovation investors to helping clients minimise investment risk and maximise ROI. ...we lived in opinion land. We’d sit around a room with people who are supposed to have ... the insights and we’d spend a lot of money if we went into testing and research.